have a ton of ideas for. We both saw a piece hanging on the back of the door (by Red Rooster) and loved it – I am seeing a mini-book cover cause I want to make use of the whole blocks, not cut them up. Isn’t the butterfly lovely? 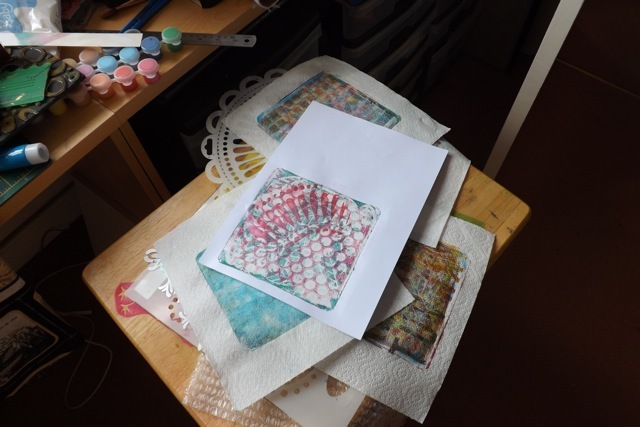 I also have my Gelli prints from the other day, waiting to be turned into SOMETHING. I was flipping thru an old Craft Stamper and saw something I am keen to try. I just need to pop to the site (how annoying they don’t list the actual URL but just the site URL – grrrr.) and see if I can download it still cause the article is an older one. So that’s me for the day. Looking forward to your desk later….